When you are shopping for a new vehicle there are a number of different features that you need to take a close look at and consider before making your final decision. Some people prefer a vehicle that has a lot of power under the hood while other people pay more attention to the interior of the vehicle. 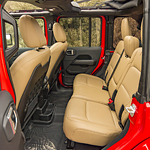 Interior comfort and functionality is very important and if this is something you take a close look at, you might want to consider the new 2018 Jeep Wrangler. Sporty, tough and practical, the Wrangler has a number of updated features this year and it definitely is a front runner in its class. The Jeep Wrangler is a great vehicle for families or for people who need something rugged to take off the main road. You will love the two different top options that let you open up your vehicle and enjoy the sun and fresh air. Stop down to Ram Country Chrysler Dodge Jeep today to take a closer look.